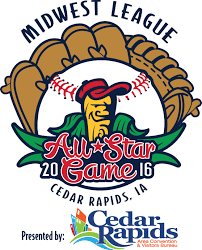 The Midwest League will hold their annual all-star game on Tuesday June 21st at Veterans Memorial Stadium in Cedar Rapids, Iowa. This game is always exciting for the prospects who are invited as they get a chance to meet some new teammates, as well as seeing how they stack up against the talent on the other side of the league. Supporters of the Toronto Blue Jays will be especially locked into the contest as their Midwest League affiliate the Lansing Lugnuts will be well represented all night. The team will be highlighted by: Juan Kelly, Andrew Guillotte, Jon Harris, Angel Perdomo, and Dusty Isaacs. All of these prospects are having excellent first halves and deserve to be recognized in this prestigious event. *Tied for third in the league in doubles with 21. 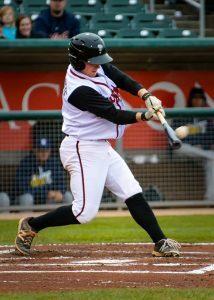 *Leads the Lugnuts in extra base hits and RBIs. Named the starting first baseman for the East team Kelly will be headlining all the Lugnuts taking part in the all-star game. Besides beginning the game, Kelly has been invited to take part in the Midwest League home run derby as well. Adding Kelly to the derby makes complete sense as he leads his team in doubles, triples, and home runs. Currently sitting at 33 extra base hits this season; Kelly has been a reliable bat whenever his team needed him most and he’ll be showcasing that ability for the rest of the league to see. The prospect is carrying a .268/.332/.496 slash line at the plate, and a .993 fielding percentage at first. Factor those together and there’s no denying that Kelly is one of the best players in the Midwest League. Excited for the opportunity to display his talents this week. Kelly believes his selection is a testament to his work ethic and dedication to the game of baseball. *Leads the Lugnuts in wins with 6. *Lowest ERA in Lugnuts rotation at 2.36. Harris has been a reliable arm this season after going through some mechanical changes during the 2015 off-season. Switching from the first base side of the rubber to the third base side has proven to be a great decision by the Blue Jays coaching staff as the righty has been dominant all season. Maintaining an impressive 1.24 WHIP and 8.8 K/9 ratio is just a small taste of what Harris has done for the Lugnuts. The righty has only allowed 14 earned runs in the first half. Harris had back-to-back outings where he went 7 innings with 11 strikeouts in May and he didn’t allow any runs in six of his 11 starts. With a season like that there’s little question why Harris was chosen by the managers of the Midwest League. While many felt that the 22-year old pitcher would be selected for the prestigious event, Harris is humbled by the news that he’ll get to represent the Blue Jays organization in Iowa. *Leads the Midwest League in saves at 12. *Leads the Lugnuts in appearances at 25. 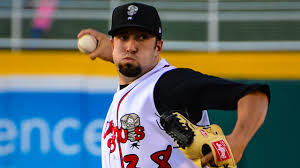 A leader by trade, Isaacs has been instrumental in the Lansing Lugnuts’ bullpen all season. Whether it’s communicating with his teammates and coaches, or coming into the game in high leverage situations, Isaacs is a great option at numerous times of the game. Spending time as a setup man and a closer during the first half, Isaacs has been lights out as he’s only allowed six earned runs in 29 2/3 innings pitched. Isaacs success comes from his excellent control on the mound. Walking only five batters and maintaining a 11.4 K/9 ratio shows the kind of ability that Isaacs brings to the mound every outing. While Isaacs is having a tremendous first half of his season he admits that he’s not one to focus too much on statistical goals. Choosing to follow the advice of his skipper John Schneider before taking part in his first professional All-Star Game, Isaacs is looking forward to the opportunity to see the best of what the Midwest League has to offer. Having fun is exactly what Isaacs has in mind before his official trip to Cedar Rapids. Looking forward to the festivities that take place during all-star week should make up for a memorable experience for the 24-year old pitcher as he plans to spend time with his family and teammates. 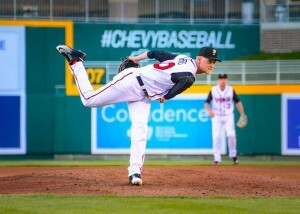 *Sixth in the Midwest League in strikeouts at 75. *Leads the Lugnuts rotation in WHIP at 1.06. 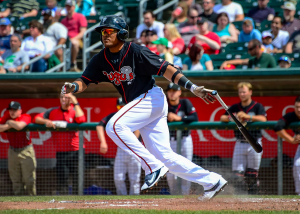 Raising his stock during the first half of the Midwest League season, Angel Perdomo was a safe bet to make the trip to Iowa. Currently sixth in the league in strikeouts, Perdomo has been nothing but overpowering against opposing hitters who are only batting .170 against the big lefty. Another indicator that Perdomo has been dominant all season is the fact that the prospect has been able to maintain an impressive 1.06 WHIP and a 11.5 K/9 ratio in 58 2/3 innings pitched this year. Getting ahead in counts with his fastball that usually sits in the mid-90’s. Perdomo can build off the heater to mix in his slider and changeup to keep hitters off-balance. Happy with where his season is at right now, Perdomo is looking forward to the potential opportunity of pitching in the All-Star Game. *Leads the Lugnuts in runs scored with 36. *Second on the Lugnuts in steals with 12. Flying under-the-radar Andrew Guillotte is a prospect Blue Jays fans should get to know. With strong defensive skills, above-average speed, and an excellent plate approach Guillotte is a guy who could climb the minor league ladder quickly if he can find consistency at every level. Carrying a respectable .258/.343/.344 slash line in the first half, Guillotte has done a nice job at getting on base. Notching 63 hits, which includes: 15 doubles, and two home runs so far this season and it appears the 23-year old outfielder is on the right path to move forward in his career. Also sporting an impressive .992 fielding percentage between the three outfield positions, Guillotte has only committed one error all season. Picking up seven outfield assists, and taken part in three double plays shows some promising talent that could play up the levels in the near future. Honored by his selection, Guillotte is looking forward to get to Iowa to network with the other recipients of this tremendous opportunity. Be sure to tune in and support your Lansing Lugnuts All-Stars Tuesday at 8:00 PM EST. 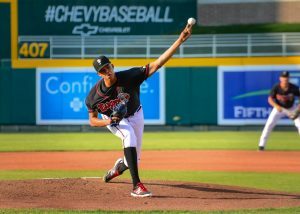 Covering the Lansing Lugnuts since 2012, Brian has interviewed several prospects and produced articles that's received a lot of attention from numerous media sources. 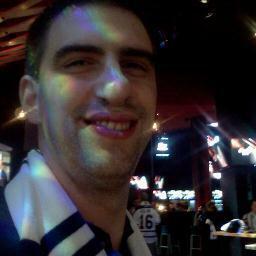 Great Lakes Loons Beat Writer for @BB_Essential, and Toronto Blue Jays Prospect Writer for @JaysProspects. Proud @IBWAA member.